Ambassador Prosor: Schabas appointment to head Gaza inquiry is like "choosing Count Dracula to run a blood bank." 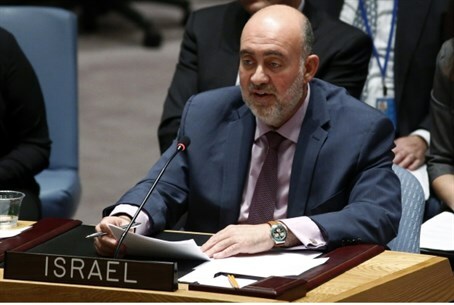 Israel’s ambassador to the United Nations, Ron Prosor, suggested on Monday that the UN condemn Hamas - not Israel - over the goings on in Gaza. “This morning during a press stakeout I held at the UN, I talked about the word 'disproportionate'. I can tell you that the only ‘disproportionate’ thing is the accusations being made against Israel by the UN and others,” wrote Prosor on his Facebook page. When it comes to the UN’s bias against Israel – this is just the tip of the iceberg. The organization chose an outspoken critic of Israel – William Schabas – to lead its Gaza inquiry. This makes about as much sense as choosing Count Dracula to run a blood bank,” he added. “I also noted that Hamas has been able to get away with its crimes thanks to the support and sponsorship it receives from Qatar,”. Qatar has proven that it controls the 3 ‘Bs’ – it can buy, bribe or bully its way to owning anything - including the 2022 World Cup,” said Prosor. “f the UN wants to take constructive steps it must aim its condemnations where they belong – with Hamas and its sponsors,” he concluded. Schabas was named last week as the head of the UN Human Rights Council’s panel tasked with investigating Israel’s alleged “war crimes” in Gaza. A video from a 2013 panel recently surfaced, in which Schabas clearly revealed his eagerness to prosecute Israel over its actions in Gaza, even if that involved “twisting things and maneuvering” in the international legal arena. In an interview with Channel 2 News following his appointment, the Canadian law professor did not deny that the international community has a double standard regarding Israel's conduct of war. In that same interview, Schabas refused to define Hamas as a terrorist organization, saying he would need to consult with the two other members of the UNHRC committee before stating an opinion to avoid any "predispositions" in judgement. Foreign Minister Avigdor Liberman has called on Israel not to cooperate with the UN’s probe. Finance Minister Yair Lapid called the UNHRC committee "a ridiculous committee of ridiculous commissionership, that instead of investigating the murder of millions of Muslims by other Muslims, investigates the most moral army on the planet; this is a disgrace for the UN."